Ginger is one of those plants that fits easily into the kitchen for cooking or making drinks. Many of us use ginger in our cooking or to make ginger beer and ginger syrup, which are both healthy drinks for for summer or winter. In summer drink we drink our ginger drinks with ice, in winter I add one or two tablespoons to black tea to add warmth and spice. 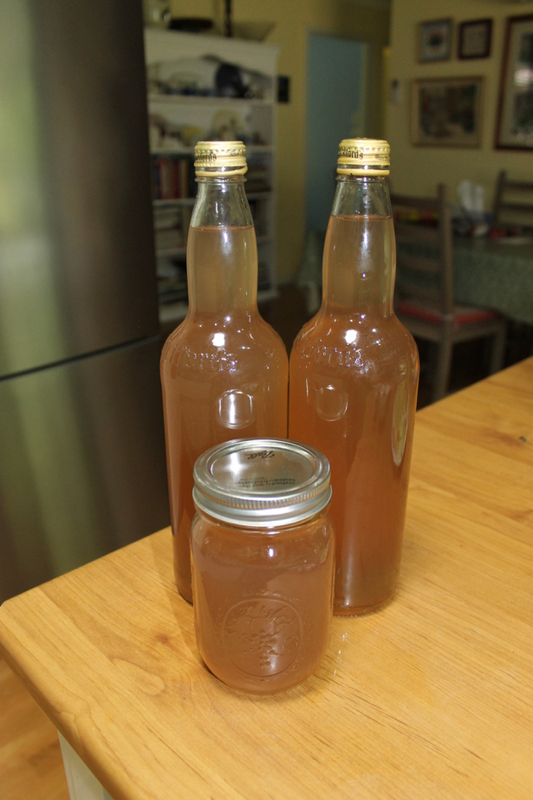 Above: the first batch of ginger syrup yielded 2 litres. Below: the second batch gave me an extra 1.2 litres. Ginger syrup is the easiest drink to make and it's a great addition to your drinks menu over the Christmas holidays. Simply grate or finely chop a large piece of ginger root, you'll need at least a cup full of ginger. Don't get too precious with the amounts - it doesn't have to be exact. To 2 litres of water add two cups of sugar and bring to the boil. When the sugar has dissolved, add the ginger and simmer the mix for an hour. Turn off the heat, put the lid on the saucepan, and leave it sitting on the stove overnight to develop flavour. 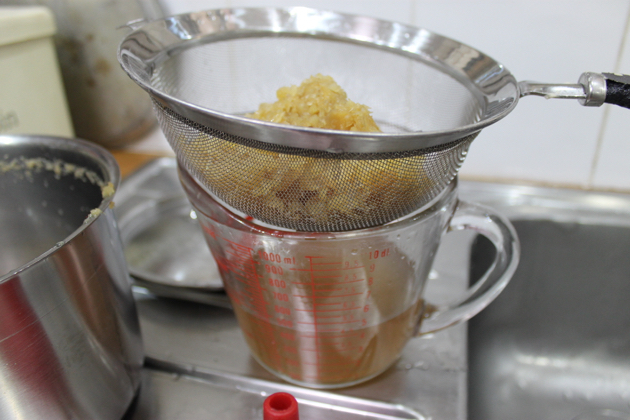 The next day, pour the mix through a fine strainer to remove the ginger pulp and store the liquid in a sealed, sterilised bottle. 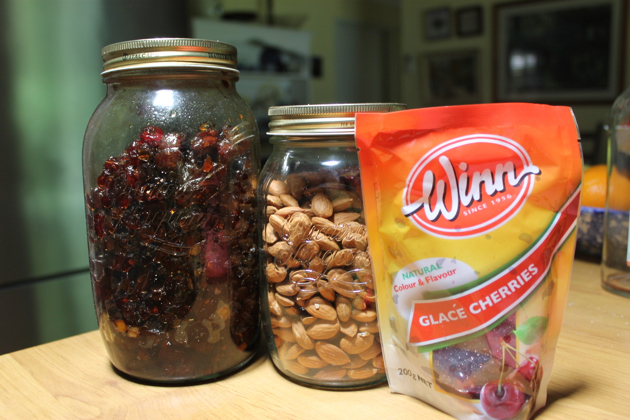 Use this mix as you would use any cordial - a small amount mixed with cold tap water or mineral water. 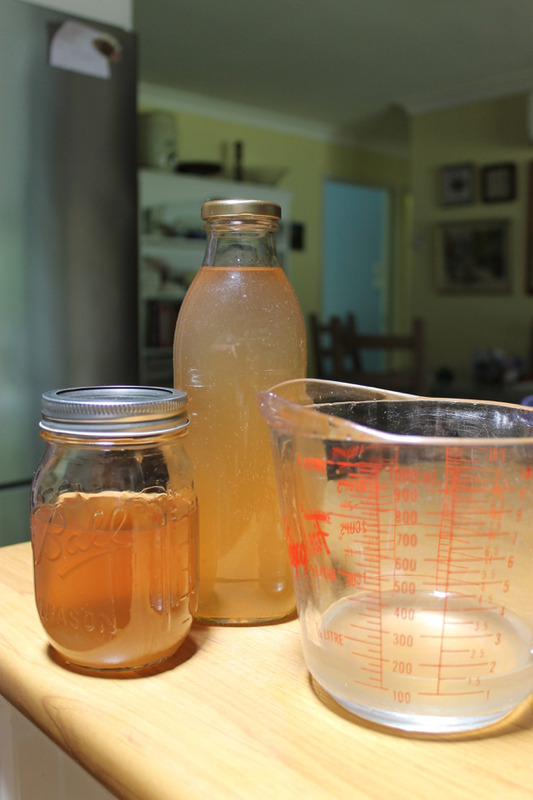 Generally this is about one part syrup to four parts water but the amount you use will depend on your own taste. Experiment until you find the right balance. 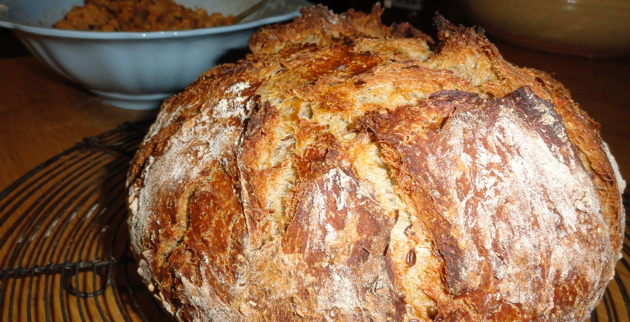 It can be stored in the cupboard or fridge. Don't throw out the ginger pulp, you'll get a second batch from it. Collect the used ginger, add it back to the saucepan and use half the amount of water and sugar you used for the first batch. The process is the same - bring to the boil, simmer for an hour, turn the heat off and leave the mix on the stove overnight. Bottle the following day. And because we are the people we are, let's try to grow our own ginger. Ginger is one of those plants that can be grown in almost all climates and although it's easy to grow, it grows slowly. It will take almost a year to grow a crop. The most difficult part of growing ginger is finding the right spot for it to grow. Some of you will have to grow it in a pot but if you're in a tropical or sub-tropical area, it can be grown in the ground as long as it's protected from wind and it gets afternoon shade. You must plant the ginger in spring. Find some fresh, plump ginger at the shop, if there are buds already forming, that's a bonus. If the piece of ginger is a large one, you can break off segments as long as they contain at least one bud and have 4 or 5 cm of rhizome under the bud. Soak the ginger overnight in a bowl of water. If you're planting in the ground, prepare the soil by adding compost and digging it in. Plant each piece of ginger about 5 cm deep with the shoots facing upwards and water in. Make sure the area you pick is protected from winds, has good drainage and gets afternoon shade. To plant in a large pot, fill the pot with good quality potting mix and plant the ginger 5cm deep with the shoots facing up. Water it in. If you're in a hot climate, the pot will need afternoon shade, in a cold climate it might need to be placed close to a wall for extra warmth but it certainly needs to be out of the wind. When it gets cold, take the pot inside to a warm sunny spot. Don't let the plant dry out but don't over water either - the ginger will rot if it sits in water for too long. After a couple of weeks, when shoots start growing, apply seaweed concentrate made up according to the instructions, or a weak liquid fertiliser. Comfrey tea is ideal. Continue to fertilise with a weak mix every two weeks until the green shoots start to die back in autumn/winter. When the shoots are brown and shrivelled, it's time to harvest your ginger. We've got a thing about fences and I bet if you're trying to work your land in specific ways, you'll have a thing for fences too. When we arrived here 19 years ago, the only fences on our land were the two separating us from our side neighbours. There was no front fence and the back boundary was marked by an ever-flowing creek. In the photo above, the fence with the green and blue gate is the one I'm writing about today. 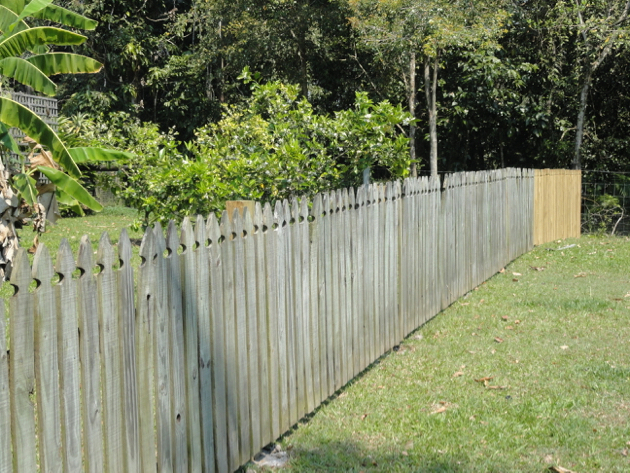 Below is a selection of older photos and one new one to show you the configuration of fences here. When we moved here we brought Murphy, our Airedale Terrier, with us, so one of our early priorities was to fence the entire yard so Murphy didn't wander off. Then we added a chicken coop with another fence. 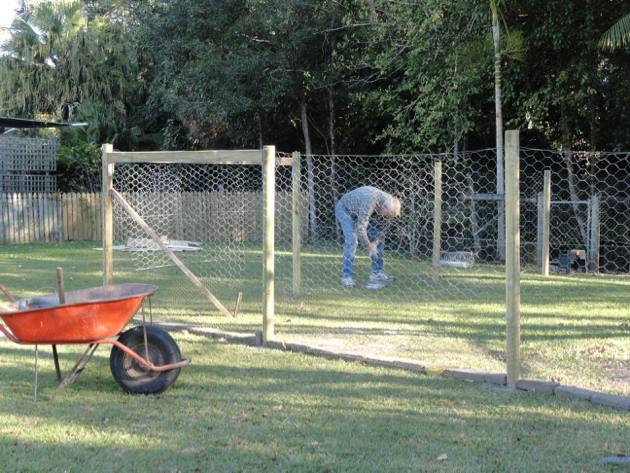 When the chickens were free ranging, we wanted to stop Murphy harassing them so another fence was built which divided the back yard. 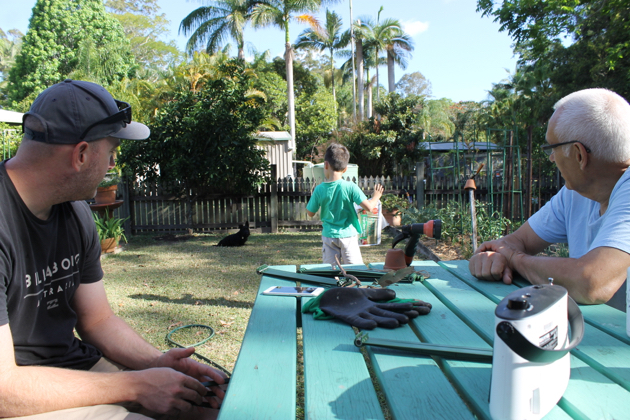 On one side there was Hanno's big shed, one tank, several fruit trees and the chickens, on the other, smaller side, the vegetable garden, a small run for Murphy, garden shed and garage. 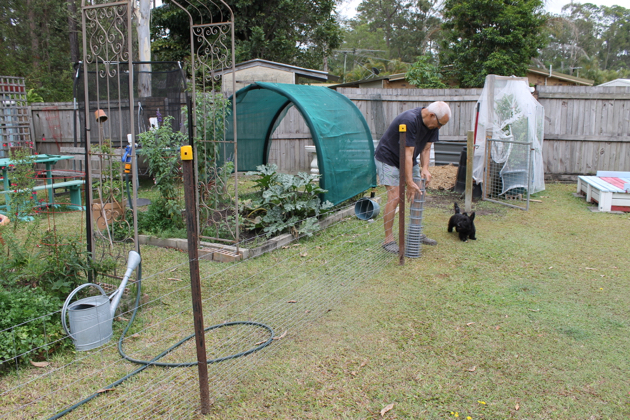 We had to then further divide the small side to keep the dogs from the vegetable garden. That fence - a picket fence, stayed through Murphy's life and served the purpose again when Rosie and Alice lived with us. When they died and we decided we'd have no more dogs, the fence came down and the backyard started opening up again. 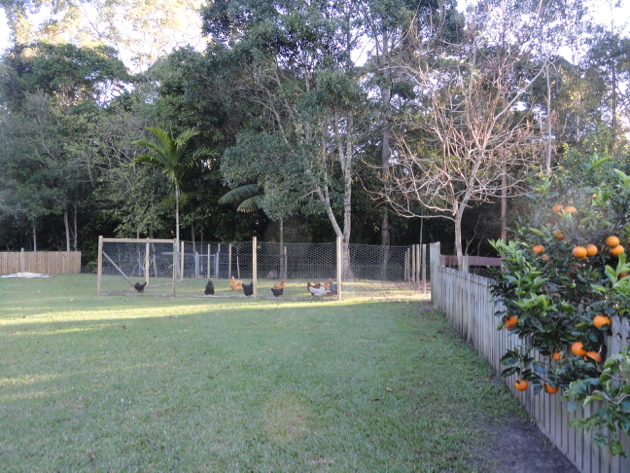 Above, where you see the orange tree, is the fence that protects the vegetable garden from the chickens. 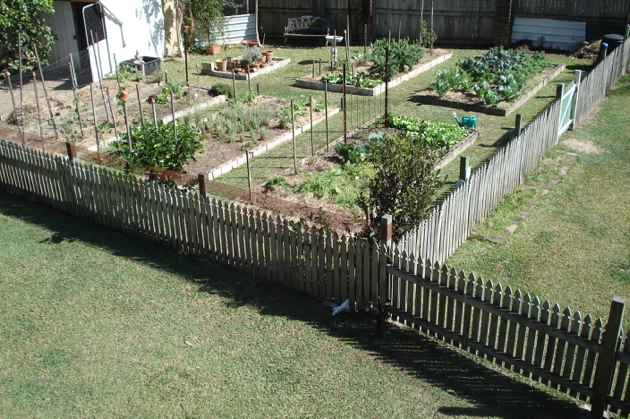 Below is the fence directly opposite that - it protects the fruit trees from the chickens. The second fence is now gone. 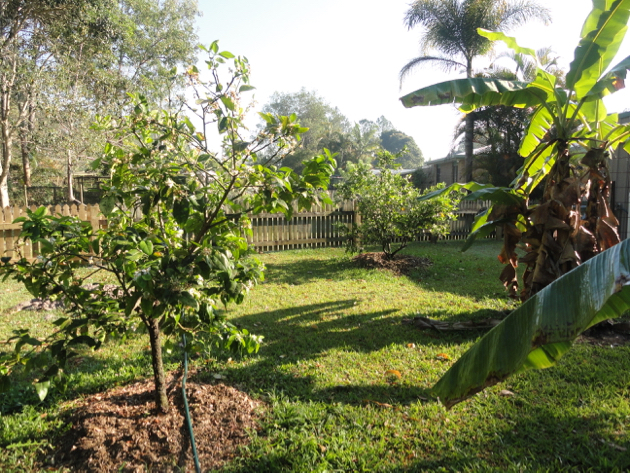 Looking out from the fruit tree area towards the house. This is one of the fences we've removed. And the view from the other side of the yard. 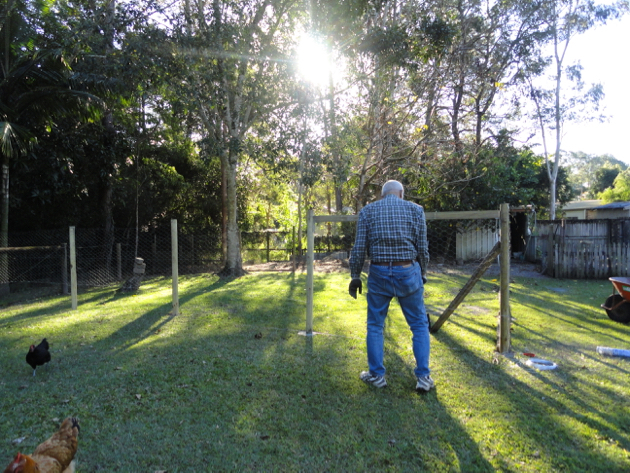 The photo above was taken yesterday with Hanno erecting another fence to keep Gracie from the vegetable garden. And this photo, taken a few years ago from the other side of that fence, is looking towards the house. A new wire fence went up yesterday. 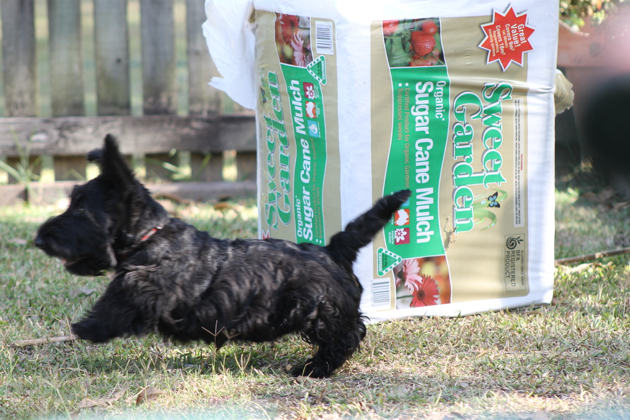 You might imagine that Gracie would run though the gardens and maybe dig every so often. Well, she doesn't do that. 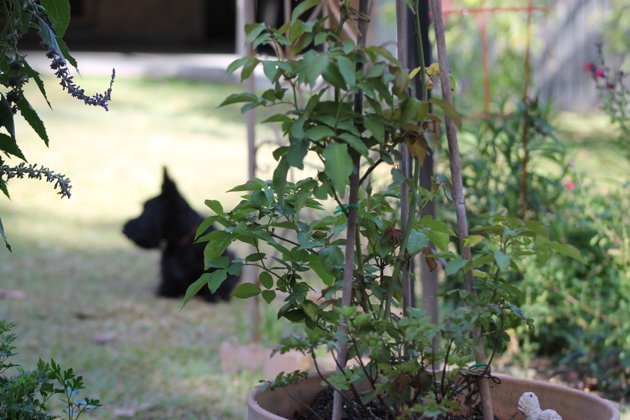 No, our puppy picks vegetables, and then she pulls out the vine or bush they have been growing on. It's very frustrating to see perfectly good vegetables shrivelled up on the lawn and the dead plant beside it. We knew we had to put up a another fence but we'd used the original pickets for something else, so Hanno decided on a puppy wire fence with star pegs. We also needed another gate but a quick look on Gumtree helped us with that for just $15. Above and below is Hanno building the extension to the chicken coop fence a few years ago. Gracie will still be allowed into the garden, but only when someone is with her. Believe me, she needs supervising. 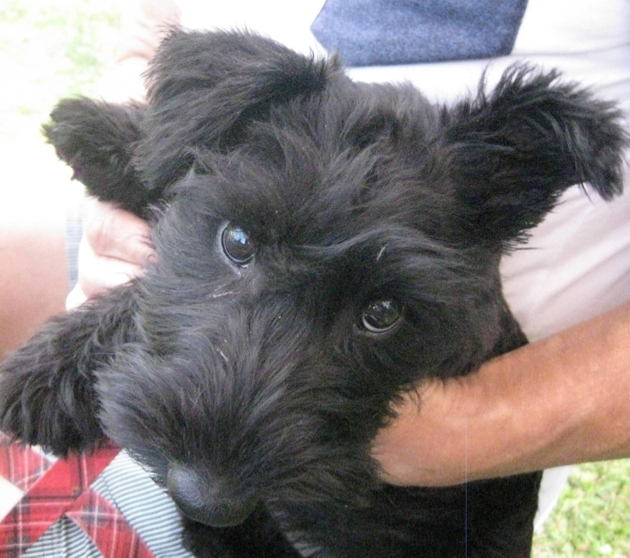 If ever there was a puppy who will get up to mischief, it's her. And even though her naughtiness is annoying at times, it's also kind of endearing and reassuring that puppies never change. Let's just hope the fences stay like this for a while. Biome Eco Stores have been a sponsor of mine for many years and I'm very proud of that association. 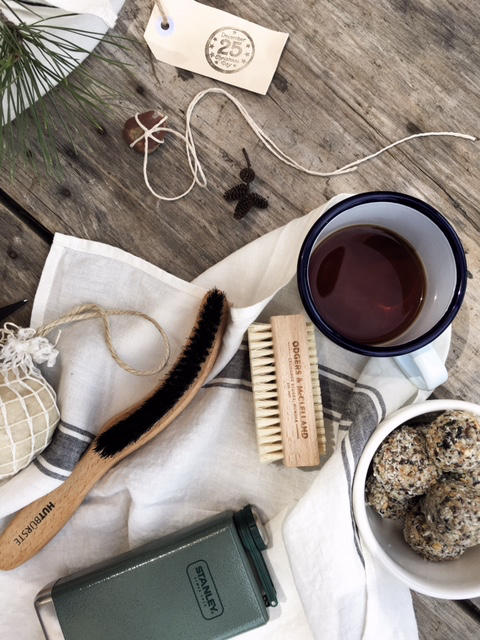 There's a lot happening for Biome at the moment with the opening of a new store and many new environmentally sound products coming into the stores in time for Christmas. They also have a great mail service so if you're near or far you can shop online. 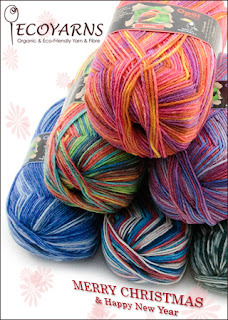 Tracey has given Down to Earth readers a special 10% off discount, valid until midnight on Christmas Eve. Use the code DOWNTOEARTH on http://www.biome.com.au to receive the discount. There is free shipping on orders over $99, or for people living in Brisbane you can shop online and elect to pick up in store at no cost. 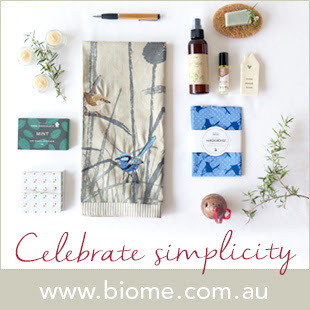 Be assured that when you shop at Biome, it will be a calming and pleasant experience - either in the store or online. Tracey has launched Australia’s first zero waste beauty bar with the opening of Biome Eco Stores’ fourth Brisbane store. Located in Brisbane’s eastern suburb Balmoral, Biome Eco Stores’ Naked Beauty Bar offers customers the opportunity to make their own natural zero-waste beauty products. The Naked Beauty Bar takes a back to basics approach, which helps customers understand the ingredients in their products. It offers a natural alternative to chemical produced products and reduces waste, providing a healthier alternative for people and the planet. A range of natural and sustainable ingredients are available at the Naked Beauty Bar. 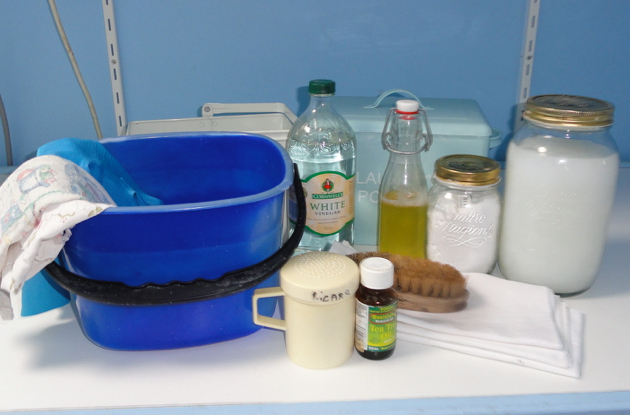 Customers can bring in their own reusable jars, select a beauty recipe to try, and take home the ingredients to make their own natural beauty products. From lip balm and body scrub to deodorant and toothpaste, customers can make various beauty products from natural ingredients including clay, salt, avocado oil, ground coffee, shea and cocoa butter, honey, vinegar, sugar, soap berries, charcoal, essential oils, petals and herbs. Customers can also view a range of environmentally friendly body loofahs, brushes, face washes and soaps. The Naked Beauty Bar is at Biome Eco Store Balmoral located at 216 Riding Road, Balmoral. When you visit Biome's website you'll be opening up a shop full of environmentally-friendly, useful, motivational and beautiful products. This is the store I get my organic makeup from, I also use their water bottles, balms, reusable produce bags and many other things. The staff are friendly and helpful and their products are good quality and ideally suited to simple life. If, like me, you don't like buying plastic toys, there is a good range of wooden toys and puzzles as well as books for toddlers through to teens. They have kitchen gadgets, blenders, mason jars, water purifiers, cheese, ginger beer and beer kits. There is makeup, books, organic cotton sheets, skin care and a whole lot more. This is a shop I highly recommend. 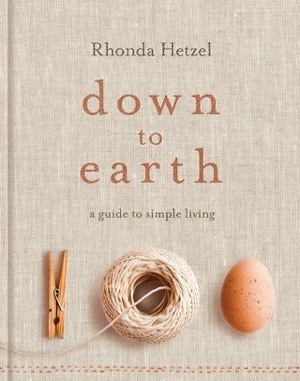 If you do some shopping at Biome, don't forget to claim Tracey's generous discount for Down to Earth readers. Gifts that add a special touch to the home will leave a lasting impression for years. 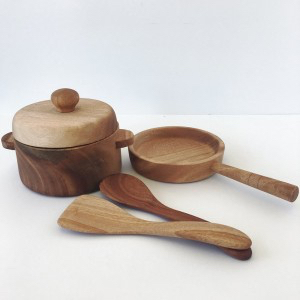 Whether it is a beautiful banksia sent pot or a Mad Millie cheese kit. 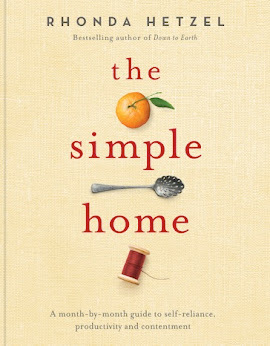 The gifts below are perfect for any person that loves to make their house a home. I've had a miserable week with allergies causing my asthma and eczema to flare up. I'm looking forward to the end of the week and the beginning of a new one with no wheezing or scratching. Things seem to be improving slowly each day so I'm hoping for a return to normal soon. It's been a bad year for hay fever, asthma and eczema, which is probably due to the weather. I fear we're on a collision course with the weather and too many people don't believe the science of climate change or don't think they have to change their ways to help remedy it. 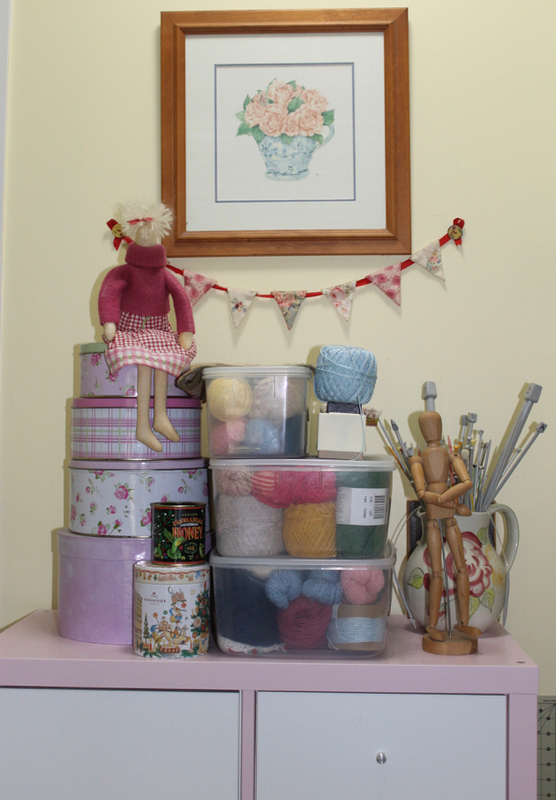 A homemakers attempt at the Ivy Lee Method of organisation. I like this! I've shared my tomato relish recipe in the past, check out Pauline's blog with her Spicy tomato relish recipe. There are some good recipes there. Soon our American friends will be waking to one of their major holidays - Thanksgiving. I want to wish you all a happy day and hope your get-togethers are full of love and make fine memories for you. I'm not about to jump on the Thanksgiving bandwagon because I'm an Australian, but I do want to use this place marker of a day to recognise that I have a good life and I'm grateful for all I have. First and foremost, every time and always, I'm grateful for my family, especially Hanno, my sons and DILs: Shane and Sarndra, Kerry and Sunny and Jens and Cathy. I'm grateful to have lived to see my grandchildren - Jamie, Alex and Eve. And of course, you all know I have a special place in my heart for my sister Tricia and her family. Every single one of those people has enriched my life and made me happy in more ways than I can count. Thank you. I have a fairly small group of close friends - people I've known for many years and a few I've met in the last ten years. They've all made a beautiful and significant difference and I can't imagine life without them. And then there's this blog. Never in my wildest dreams did I ever think the people I connected with online would become real and important to me. 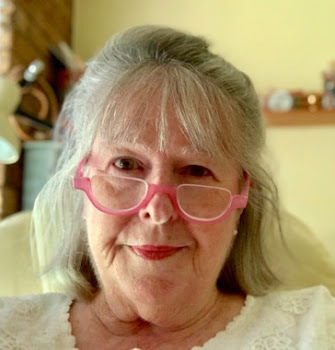 When I started my blog I guess I thought it would be a mostly one-sided affair but as you all flowed in, bringing with you your own blogs, emails and comments, I did connect with many of you, relationships built, and I found myself thinking of so many of you as I made the bed or mopped a floor. Now we have this magnificent network of women and men who know about each others families and care what happens to them. It's a strange new world we live in, friends. A world where we don't have to see, touch, smell and feel other people for them to make their way into our consciousness and sometimes our hearts. So I'll just take a little bit of the Thanksgiving day to acknowledge and honour the gratitude I feel constantly, and to thank you all - near and far, for being part of my life. I'm going to be a bit cheeky here and suggest that one of my books might make a good Christmas gift. All three are on special at Booktopia, at good prices. For my UK and European friends, Book Depositary also have a special price on all my books. And for everyone in northern America, Amazon have the three Kindle versions. 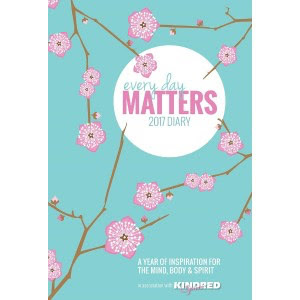 You still have time to order the books online and have them delivered before Christmas. 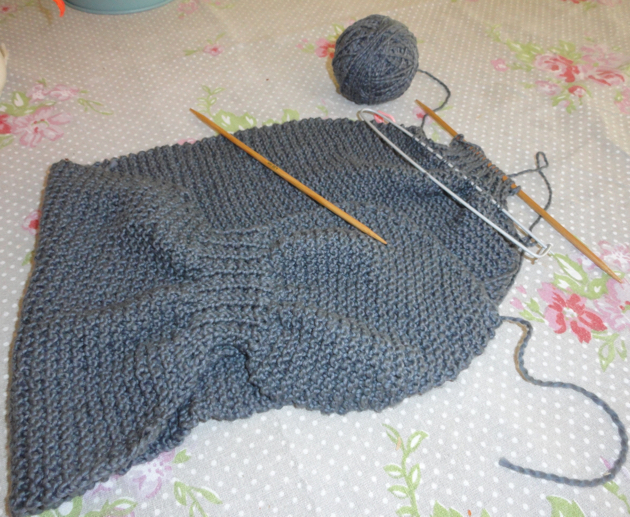 If you intend doing some Christmas knitting this year, or want to learn how to knit, the week after Christmas is the ideal opportunity to take some time for yourself and develop a new skill. 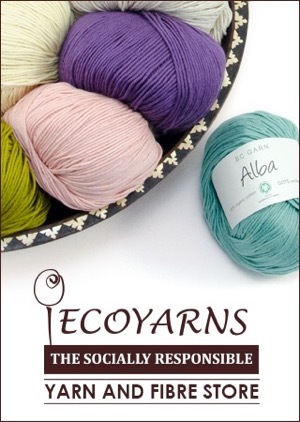 Salahan at Eco Yarns, one of my valued sponsors has an excellent range of good quality of eco-friendly yarns that suit most purposes. Put your order in now or by early December to make sure you have your wools, cottons and knitting needs before Christmas. 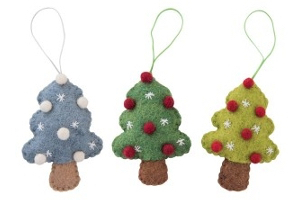 Next week I hope to have information from the lovely Biome stores about their Christmas trading and gift ideas. Do you know what to plant? We've reached the point in our gardening year when we've stopped planting. We still have a fair bit of gardening to do but there will be no new plants added. 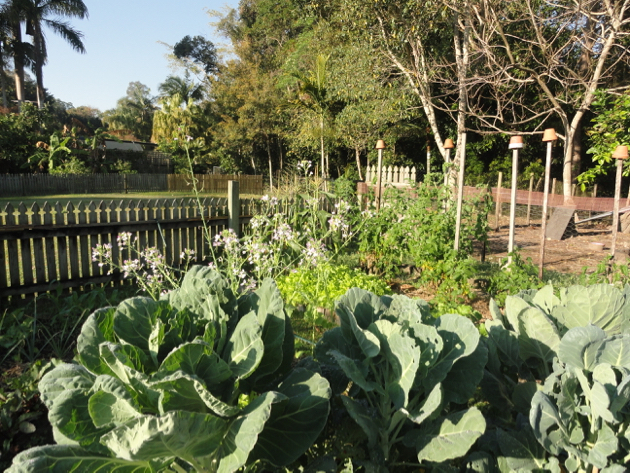 Our leafy greens finished early because of the large numbers of insects this year. We don't fight them with insecticides, we just stop growing what they eat. 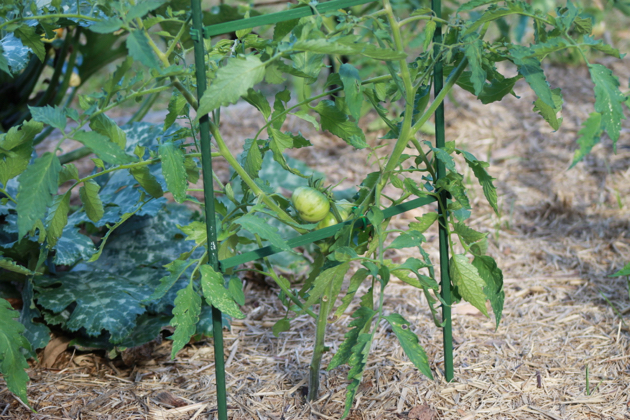 The tomatoes and cucumbers are in and mulched, now I have to keep the water up to the citrus and berries so that in a year of less rain than normal here, we'll still have a good supply of fruit in the coming autumn and winter. Thank heavens for tank water. We're always working for now but planning for what will come later in the garden. It makes things easier when we know what's ahead and are prepared for it. And that applies to our general lives too. We're always planning ahead, always wanting to arrive at a new stage of life with at lease some of the preparation and thinking done so it's not a struggle or a burden. Always lurking - the black shadow, ready to bite any toe at any time. And here she is playing with Jamie. 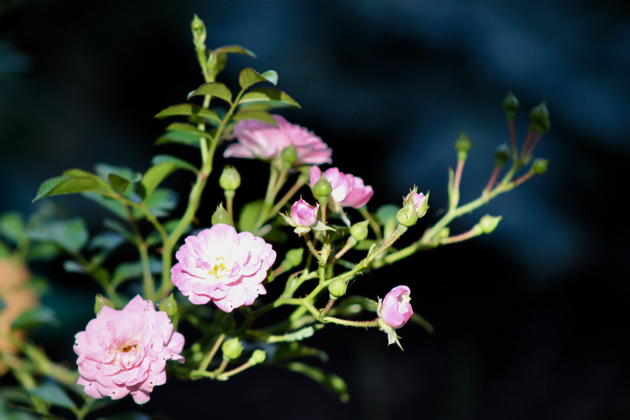 Always add flowers to your garden because they'll attract beneficial insects. Purple, blue and yellow flowers seem to be the most attractive to insects where I live but all flowers will lure bees, wasps and hoverflies in. 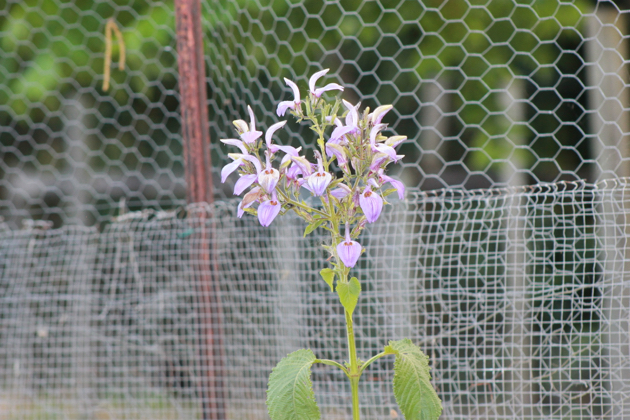 Above is The Fairy rose and below is a blue sage that grows two metres high. It requires hardly any watering and is a great plant for dry gardens. I often get emails asking about this and that relating to gardening but one of the most often asked questions is: What should I grow? I can never answer that question because my climate might be totally the opposite of yours, our tastes might differ and I have time whereas, you might not have. 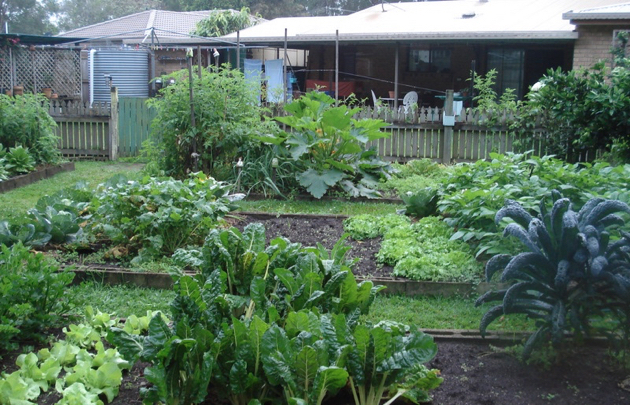 When planning your garden, grow what you eat. Make a list of every vegetable you eat. Research what season each plant grows in and what conditions they need, discard those you can't grow, then divide your list into seasons - that is your planting list. If you've got too many on the list, work out which vegetables are the best picked and eaten straight away. For example, both corn and peas should be eaten within a few hours of harvesting if you want to experience the best of them. After harvesting, corn and peas start converting their natural sugars into starch and that affects the taste and texture. So if you love corn and peas, plant them. You could also select the most expensive vegetables to buy at the market and grow those because they'll be cheaper and better grown at home, or if you're a new gardener, choose the easiest to grow - lettuce, Asian greens, carrots, radishes. 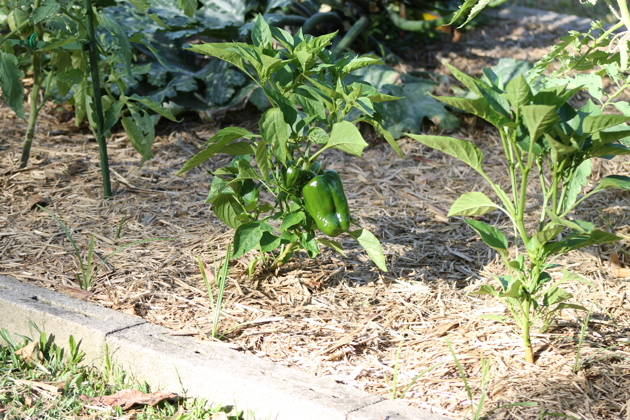 The first of the tomatoes (above) and capsicums (below). And don't forget herbs. I routinely use parsley, oregano, basil, rosemary, thyme and mint in my cooking. All of them are easy to grow here and one plant will last at least a season, often two seasons, so it saves me money to grow herbs. I also grow Welsh onions which are perennial green onions. I use them in the same way I use chives or spring/green onions. If I were to buy all those herbs every week, it would cost me at least ten dollars just for herbs. Planting half a dozen herb seedlings in Spring, or keeping perennial or biennial herbs going through the year, is wise economy. The berries are growing well this year. 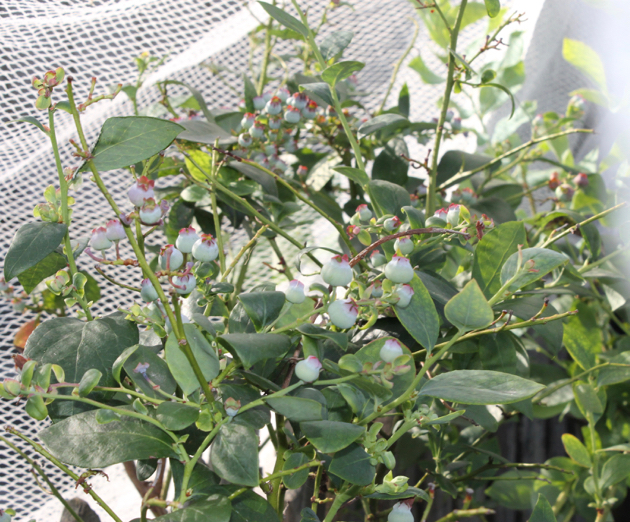 Here is the second flush of blueberries (above) and the Young berry is starting to climb the trellis (below). 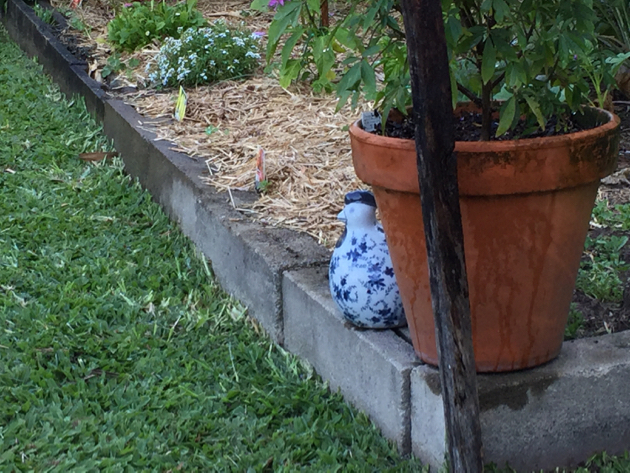 A farmer in Maleny gave my the Young berry. 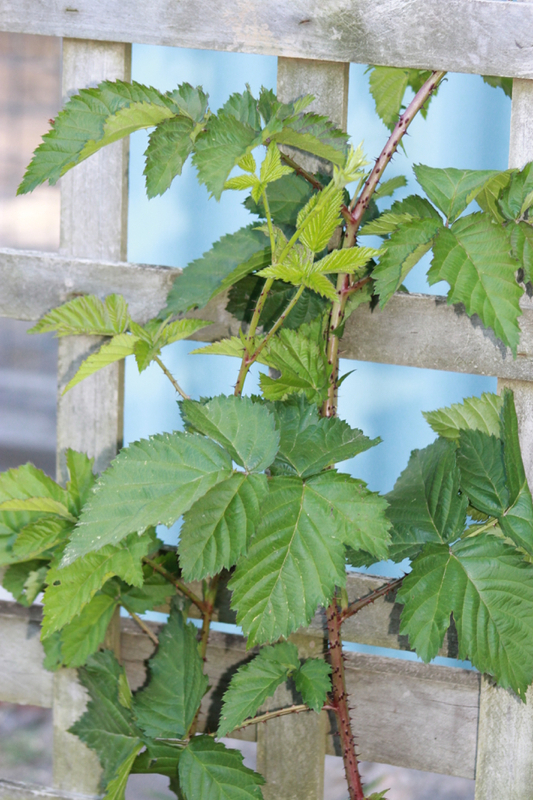 It's native to northern America and is very similar to a raspberry. 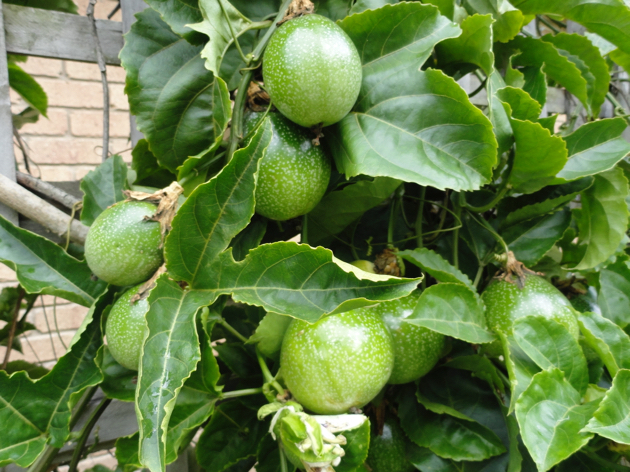 Don't forget fruit trees, passionfruit vines, and berries. These are longer term plants and will cost more than a seedling but they'll produce fruit over a number of years. I think of fruit as an investment. 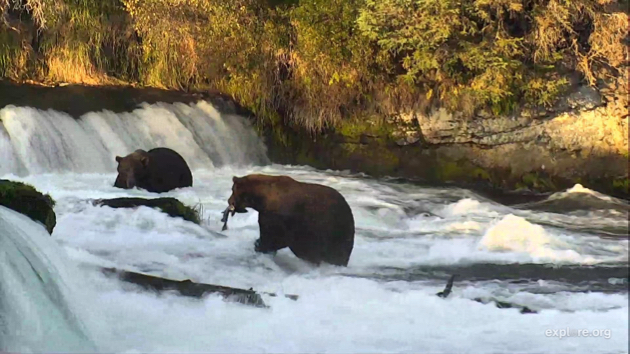 As long as they're fed and watered, they look after themselves. They'll need mulching if you're in a hot area, and pruning occasionally, but they're easy care plants once they're in the ground and growing. 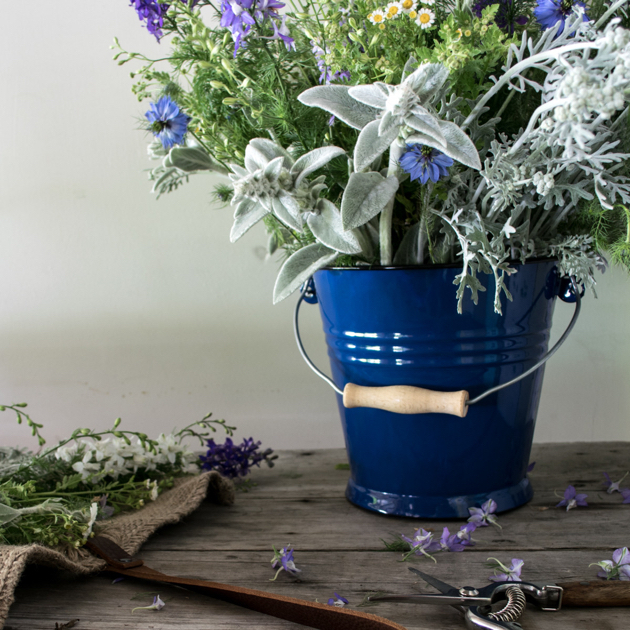 In The Simple Home I wrote about container gardens. They're great if you're renting or don't have much land or time. You'll still get a crop and although it will probably be smaller than an in-the-ground garden harvest, the work load is smaller too. 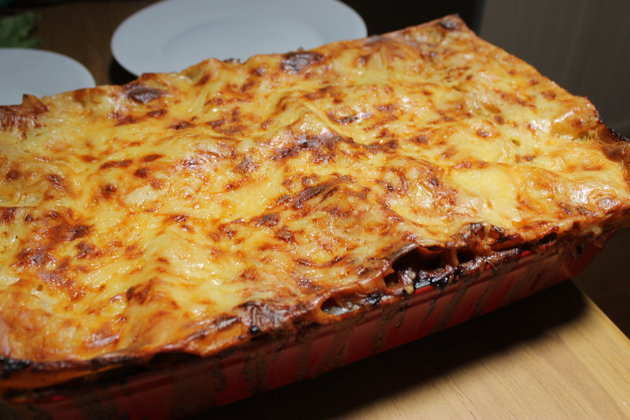 Lasagne, one of our home cooked meals during the week. 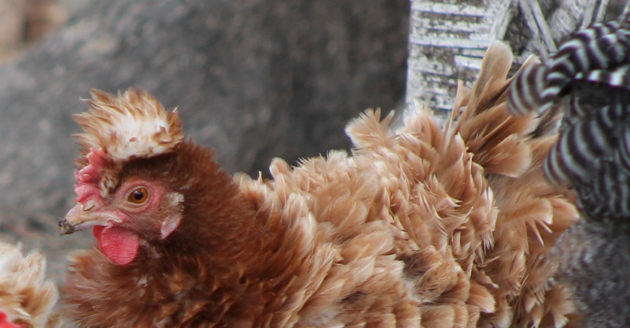 What happened to the walled garden way of producing food, using only renewable energy? I'm sure many of you feel this too, the luxurious freedom you have when you can do whatever you want to do, everyday. It's difficult to explain what a life of that feels like. But I probably don't have to explain it to you, those who experience it, know, those who want it can probably imagine something close to it. Outside our closed gate the world is spinning faster and many things no longer make sense to me. Its been so long since I took any notice of advertising or brands that now I no longer recognise what is popular. I don't mind that, in fact it's been good for me, but it does mean I move further away from, and possibly lose touch with, what most people strive for. Inside for breakfast, messages to friends, phone call to my sister and friend in Townsville and another cup of tea. 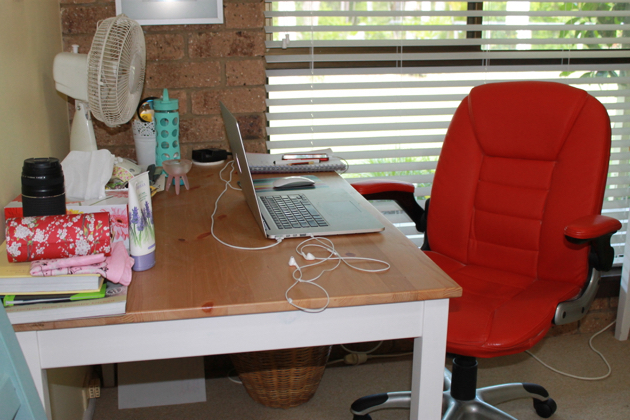 I clean both bathrooms, check the kitchen, make the bed and check the blog, forum and emails. 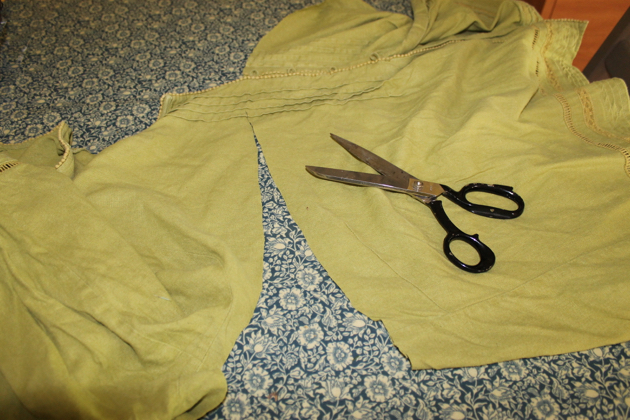 When I do all I have to do, I walked away and started cutting out the little dress I'm making out of my old blouse. 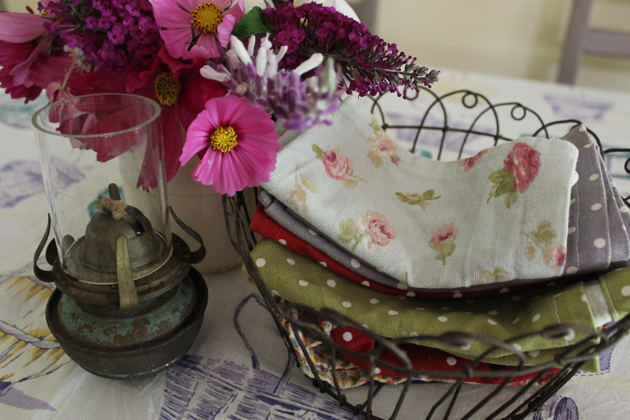 I'll be making some little nighties soon too - some very plain pink lawn nighties for the hot nights here. 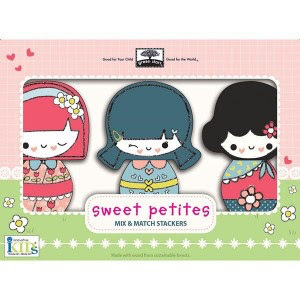 They're for my grand daughter and I should have them finished this week. Waiting in the wings are the ingredients for my Christmas cake, which I will make this week. Hanno asked when I planned on making it. I think he wants to feast on the cake well before Christmas. I need to make soap and laundry liquid fairly soon, Christmas gifts have to be created and sewn and I make time for reading most days. 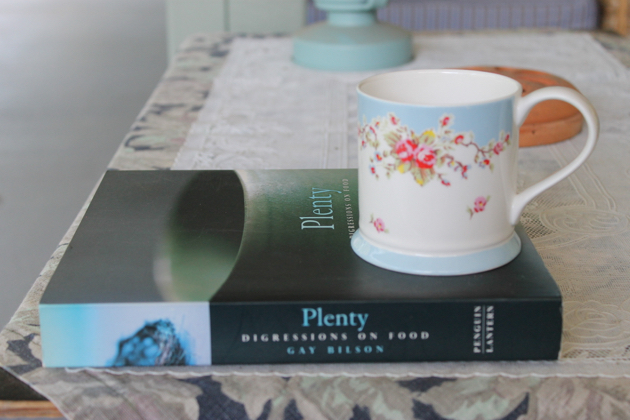 My current book is Gay Bilson's Plenty. I found an old copy on ebay and bought it a couple of months ago. I'm taking my time with it and enjoying it very much - it's thought-provoking, intelligent and the ideal book to relax with on the verandah. We have our main meal at lunchtime and after lunch, I usually have a nap in the lounge room. It feels so indulgent to slip into sleep when I know the busy world is spinning and most people are out working. But I've done all that. I worked out there for many years, paid taxes, helped out in the various communities I've lived in, done a lot of volunteering, raised a family and been the person I was raised to be. Now it's my turn to choose what I do, to sleep when I feel like it, to spoil a little black dog and to enjoy every day that dawns for me. This is not the way I thought my days would play out. A long time ago I thought I'd work a lot longer and then travel, but my life changed in many profound ways and I'm much happier for it. And now it all sounds ordinary and simple because it is - these small daily tasks help me create the life I want to live. 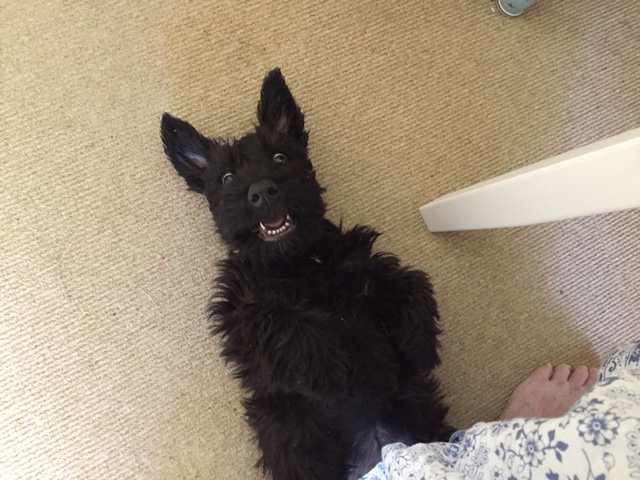 The freedom to choose is there every day and the good thing is that most days turn into peaceful, calm days full of homemaking, gardening, family, sewing, mending, reading and playing with a little black Scottie dog called Gracie who likes to bite toes. Many people are starting to think about Christmas and while I don't recommend you start shopping and blow your budget, if you're looking for good quality gifts and you're in Australia, I might have some useful information for you. 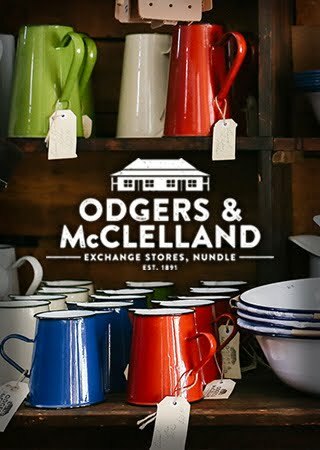 My sponsors, Megan and Duncan at Odgers and McClelland Exchange Stores, offer a wide variety of good quality, useful products that suit the simple home down to a tee. 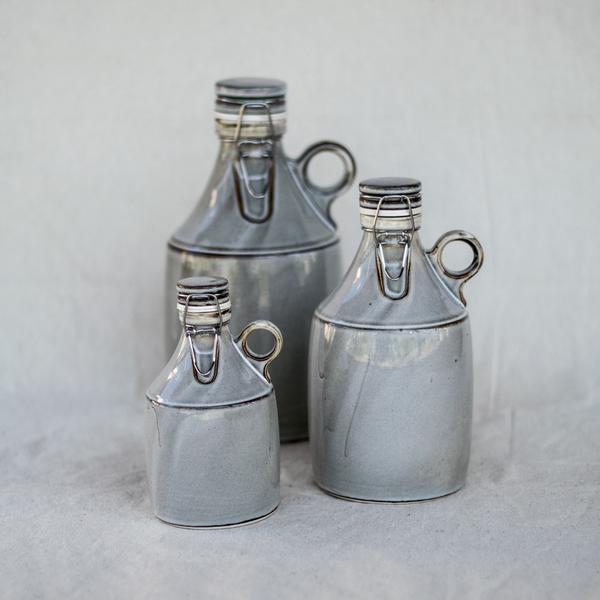 Growlers - used to transport fermenting brews. The items they sell facilitate the productive side of life and many of them are hard to find elsewhere. If you're looking for gifts, or for items for your own home, have a look at the website and I'm sure you'll find goods you'd be happy to give or to have in your home. 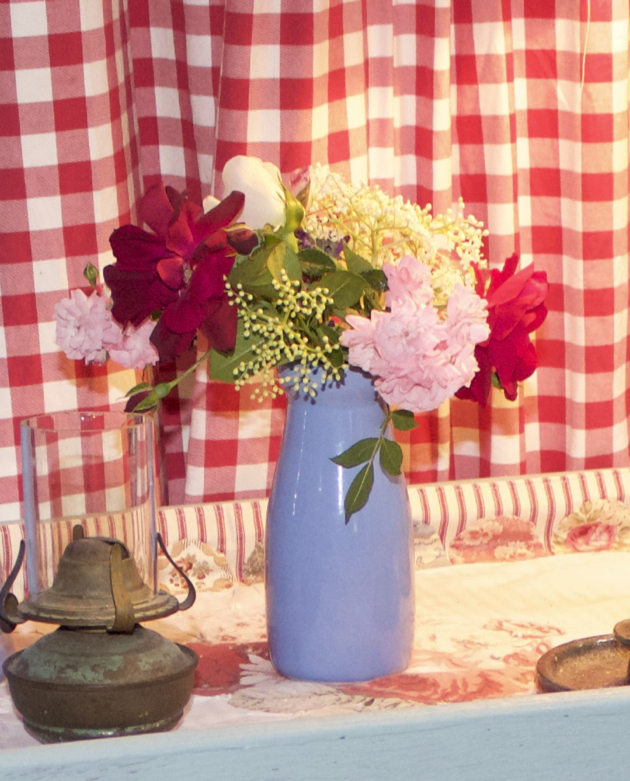 I have several of their jugs - both the Romanian enamelware and the Robert Gordon porcelain jugs. They're practical, beautiful and decorative. I have a number of their Falconware enamelware items too. 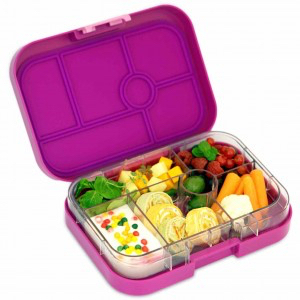 It's all durable, very useable, good quality and will last a lifetime if you care for it. Don't forget the garden products if you have a keen gardener in your family. 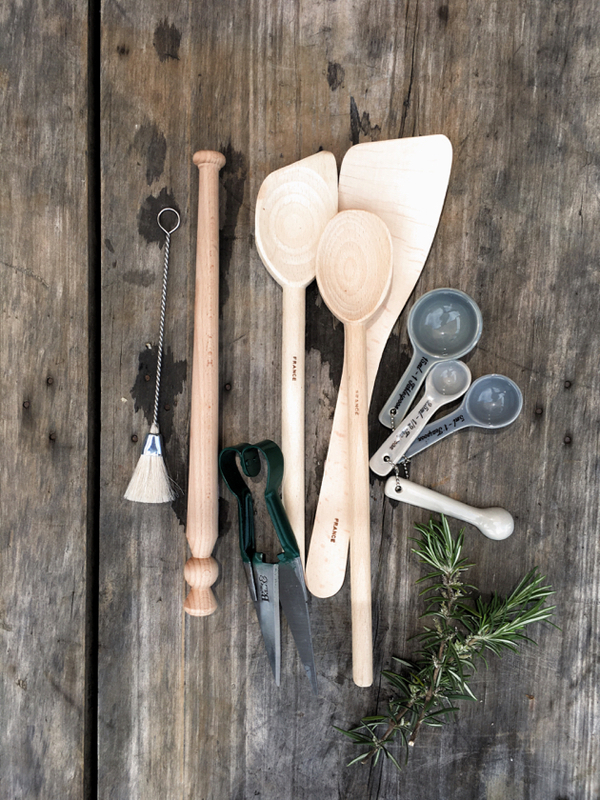 I've been using the Burgon and Ball hand trowel, fork and watering can and absolutely love them all. At the moment I have my eye on the short leather gardening gloves at $33.95 and the Sophie Conran trug at $54.95. Both would make excellent gifts for gardeners. Looking for a pudding bowl? Have a look at the Forest pudding bowl and the plain ones, both are excellent quality and won't let you down. 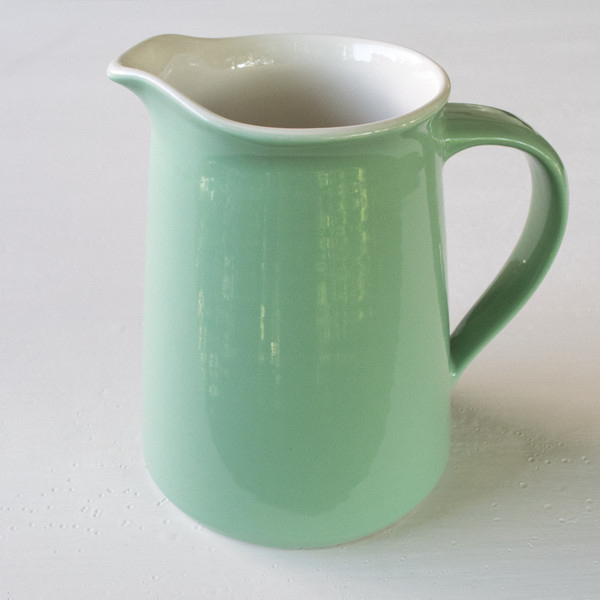 Robert Gordon jug, in one of many beautiful colours. It's difficult trying to buy good quality gifts that actually fit into the lifestyle of the person you're giving to. I'm happy to recommend Odgers and McClelland Exchange Stores. They offer a fast and friendly service and will post to everywhere in Australia. PLEASE NOTE: Megan said the soap savers are in the store again. If you missed out before, send her an email. 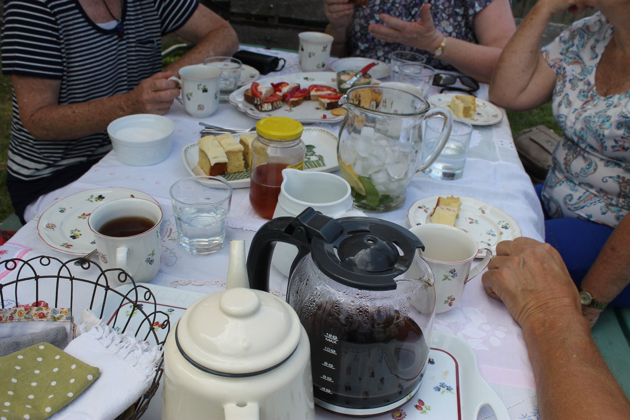 We had afternoon tea in the garden with friends this week. It was nothing fancy but it was enjoyable and memorable. It doesn't take much to make a memorable afternoon. It's usually just the opportunity, some effort and a place to sit and talk with lovely people - it's a magical combination. A meat-free Turin? Is Italy’s first 'vegetarian city' a recipe for disaster? Let's just make this clear at the beginning. I LOVE the internet. In my opinion, the internet is the single most important innovation to have happened in my lifetime. It has helped people and communities unite; it abolished many invisible doors that kept ordinary people away from power; it's enabled many to publish books and their own thoughts for the world to see; it's brought experts in various fields into remote areas to give advice and ideas directly to the people who need their help; it gives us more information at a finger stroke than was ever available in the libraries of my youth; it helps develop friendships and sometimes love; it enables all of us to roam the virtual world so that we can look at towns and cities we will never visit and the top of mountains we will never climb; we can watch bears catching fish, live, in a remote wild river; we can visit each others homes and watch families grow and we celebrate births and marriages and mourn the death of friends we've never met. We can also shop on the internet, pay bills, get an education at home and work hundreds of kilometres away from our place of employment. The internet is a great teacher and we use it to learn how to sew, knit, create a garden, make jam, baskets, soap and hundreds of other things by googling our interest and choosing from a wide selection of offerings. Without the internet you wouldn't know I exist and I would never have known how many people all over the world share my values, work ethic and beliefs. It's not all light and hope though. The internet has brought us a lot of ugliness, cruelty and despair too. But that's another story for another time. To put it in a nutshell, the internet opens up opportunities, both good and bad, that can change lives. But it has to be balanced by spending time in the outernet. Problems are created when balance isn't there every single day because of the temptation to spend hours online. When I closed my business and started working at home I didn't have enough hours in the day to do everything I wanted to do. My main aim was to produce a lot of what I used to buy, to make my home a place I felt comfortable in, to change my home so it facilitated the work I wanted to do and to be creative enough to satisfy the part of me that needs intellectual stimulation. So I planned creative work into my ordinary days and started to build a life that was slow, simple, plain and satisfying. The creation of that new life gave me more chances to use my computer but apart from the forum and my blog, I consciously restricted my hours on the internet. I didn't want to experience life through a screen because real life gave me so many opportunities to see, feel, know, touch, smell and experience. And that has changed me in profound ways. I'm a different person now and I think that has come about because I actively lived life and not just watched it. How do you deal with the internet? Do you restrict yourself or are you living life online?